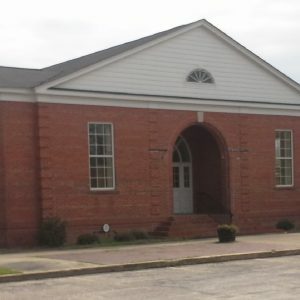 Butler School, located on this site since 1921, was the second school to serve Hartsville’s black community. Known as the Darlington County Training School until 1939, it was renamed for Rev. Henry H. Butler, its principal from 1909 to 1946. The first building on this site burned in 1961, extant buildings date from 1936 to the mid-1960s. Butler School was a junior high and high school when it was closed in 1982. Alumni formed the Butler Heritage Foundation, which acquired and renovated the historic campus and reopened it as a community center. A popular homecoming, Butler Heritage Week, is held each July.